Los Angeles, CA, October 26,2010 /PN/ The Annenberg Space for Photography is pleased to present Extreme Exposure, a group exhibit featuring arresting imagery from five unique talents in photography who work on the edge of wildlife, climate and environment. These photographers have made careers of capturing some of our planet’s most extreme environments, while dangling from a helicopter or immersed in alligator-infested waters; enduring freezing temperatures for months or braving an angry volcano. They share an intense passion and purpose, and use their photos to protect places, species and landscapes they care about. 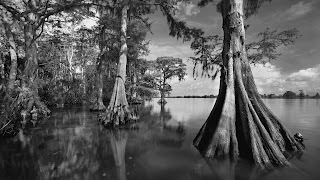 Swamplands captured by Clyde Butcher using a bold interplay of shadow and light. Lush jungle photography by Michael Nichols that brings the audience nearly face-to-face with tigers and gorillas. 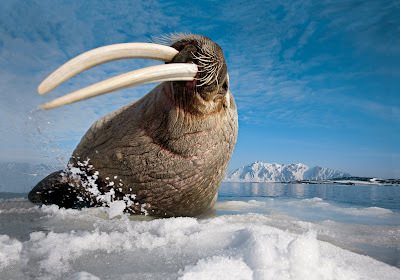 Paul Nicklen’s transfixing photos of the alien landscapes found in polar regions and the rare animals inhabiting these isolated environments. Donna and Stephen James O’Meara’s vibrant photos of erupting volcanoes and dancing molten lava. In addition to the print exhibit, digital film presentations expand the visitor experience by sharing hundreds more images, as well as insights from photographers, on the Photography Space’s high –resolution screens. Viewers are immersed in breathtaking imagery, while gaining a perspective that only the photographers can provide. The exhibit’s featured artists recount the many adventures that provided their stunning photographs, their creative methods and what it takes to work in such exotic locations. The Annenberg Space for Photography offers an opportunity for visitors to hear in person accounts of these and other extreme photographers discussing their work and the lengths they go to bring their images to the public as part of the IRIS Nights lecture series. Guest speakers include National Geographic contributors Donna and Stephen James O’Meara, Michael Nichols, Karen Kasmauski, George Steinmetz and Mark Moffett, as well as acclaimed photographers Clyde Butcher, Tyler Stableford, Mark Fisher, Cyril Christo and Marie Wilkinson, Aaron Huey and Steven Alvarez. The IRIS Nights lecture series takes place Thursday evenings in the Photography Space and is free to the public with advance registration. Full schedule is listed below. Extreme Exposure runs from October 23, 2010 through April 17, 2011. Topic: Does the Moon Affect Volcanoes on Earth? Stephen James O'Meara is an award-winning astronomer and National Geographic photographer specializing in volcanic eruptions around the world and how they affect humanity. Aaron Huey will speak about his experience and photographs from his solo walk across America and discuss the influences carried over from that event into the rest of his career in photojournalism. Cyril Christo and Marie Wilkinson will discuss documenting the disappearance of the elephant from Africa and their book Walking Thunder. Earth from Below is photojournalist Steve Alvarez’s chronicle of the world’s unseen landscapes from his cave expeditions to the most remote corners of the earth including the world’s deepest cave in Abkhazia on the border with Russia, the vertigo-inspiring pits of his native Tennessee in the U.S. and more. National Geographic photographer and editor-at-large Michael Nichols’ talk, "Photographing Nature's Giants," will showcase the images and stories behind some of his most impressive assignments, including his most recent work in the California Redwoods. Nichols will discuss how he made a complex mosaic photograph, as well as his experience photographing elephants, tigers and gorillas all over the world. Karen Kasmauski has built her career on close observation of people, specializing in bringing a human face to the impact of science and social developments. In her lecture, Kasmauski will share experiences from her work on a variety of challenging assignments, showing how she explores multifaceted issues and finds ways to connect with people, developing engaging stories and meaningful photographs. George Steinmetz has been a regular contributor to National Geographic and GEO magazines for over two decades. This presentation will cover Steinmetz’s work on all continents, as well as examine the themes of ecology and sustainability in areas that few have ever visited. As a professional photographer and mountaineer, Mark Fisher has been fortunate to combine and develop his passions into a successful career through a mix of formal education, personal exploration and mentorship from top-notch photographers and mountaineers around the world. His work emphasizes action sports, outdoor lifestyle and environmental portraiture. Clyde Butcher will share the journey that brought his life from a career in architecture to one as a landscape photographer. The lecture will cover his adventures photographing in the wilds of the Everglades ecosystem, his photography and the environment. Mark Moffett is a Harvard-trained ecologist who has had close to 500 images in National Geographic magazine, mostly of the small and little-appreciated: spiders, frogs, snakes. His goal in photography is to make people fall in love with the unexpected in nature. Tyler Stableford is an award-winning adventure photographer and filmmaker who will take the audience behind the scenes of his latest assignments, from exploring rare ice caves to covering the dangerous lives of underground coal miners. He will also show DSLR films of flying with F-16 fighter pilots and skiing with Paralympic athletes. This Slideshow night will showcase a select group of handpicked national and international photographers who work on the edge to capture wildlife, climate, environment, culture and challenging conditions and situations. The screens of the Annenberg Space for Photography will display an array of exciting images that compliment the current exhibition. Complimentary food and beverage will be provided to registered guests. Donna O’Meara is recognized worldwide as an award-winning volcano photographer, author and volcano expert. She will discuss how she began shooting active volcanoes and some of the fun, scary and strange adventures her work has taken her on. Wednesday through Sunday: 11am-6pm; Closed Monday and Tuesday.